The lace wedding dress is a timeless classic. It is important for the bride to look amazing on her wedding day. Lace and other embellishments add to the beauty of the dress. Lace wedding dresses come in many different sizes and styles. The top ten styles that are adorned in lace are listed below. The empire wedding dress is a high-waist dress with a narrow skirt. The bodice of this type of dress is usually very short with a floor length skirt. This style is suited for a range of materials, including lace. The shape of the dress creates a slimming effect that will flatter most body types. A ball gown wedding dress is similar to the empire style, but it boasts a full skirt. The bodice of the ball gown dress is fitted, and sometimes consists of a corset. This type of dress is more of a traditional wedding dress suited for a large formal wedding. Lace and tulle usually adorn the ball gown wedding dress. The sweetheart lace wedding dress is a dress with a rounded bodice. The neckline of this type of dress resembles the top of a heart, hence the name. A sweetheart dress can have elements of other styles of wedding dress combined in them. 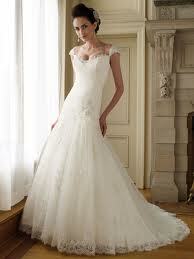 For example, a sweetheart wedding dress can be purchased with a full skirt to create a ball gown styled dress. Lace and beads on the bodice are commonly found on these dresses. An A-line wedding dress resembles the uppercase A in shape. The bodice is slim and narrow, while the skirt slopes outward in a straight line from the hips to the floor. Most traditional A-line wedding gowns are floor length with a full train, but knee length styles can also be found. Lace A-line gowns will compliment any figure with their slimming effects and illusion of height. A dropped waist wedding gown features a full bodice that flows from bust to hip. At the hips the dress opens up to a full or mermaid style skirt. The gown accentuates the natural curves of the bride’s body. Dropped waist dresses can feature any type of neckline and strap style. Typically they are created with either a sweetheart or strapless neckline. The scoop style wedding dress offers a plunging neckline that scoops the bust. This style is most often seen in dresses and gowns with thin straps or sleeves. Dresses with the scoop neckline can have any size or shape of skirt, but A-line is the most common. Lace adornments within the bodice of a scoop bridal gown will create a dramatic and beautiful effect. The one-shoulder lace bridal gown is a traditional gown with only one strap or sleeve. The bodice can either be short or long, depending on the cut of the dress. This type of wedding dress allows for variety since both the bodice and skirt can be in different styles according to taste. A one-shoulder gown can be made up of almost any fabric with adornments in a variety of colors and materials. Mermaid bridal dresses are a unique style of dress that features a very long bodice with a flowing skirt. The bodice usually extends past the hips to anywhere between the mid-thigh and shin area. The skirt portion of the dress will then flow out from the fitted bodice, giving the appearance of mermaid fins. Curves are accentuated with this style of dress, most commonly suited for an hourglass figure. Common materials that make up the skirt are tulle, satin, or lace. Halter style lace wedding dresses are characterized by a halter top consisting of two straps that connect at the back of the neck. Gowns in this style can have a V-neck, scoop, or sweetheart neckline. The bride has a choice of bodice length and skirt style. Any bodice and skirt can be paired with the halter neckline. These gowns can be adorned any style and material appliqué suited to the bride’s taste. 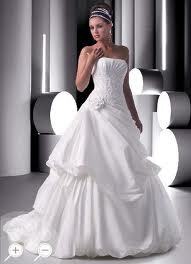 The strapless wedding gown is one of the most popular styles of dress for a bride to wear on her big day. As with the other neckline styles, a strapless gown can be customized according to how the bride wants to look. There is a choice of bodice length and skirt length and type. 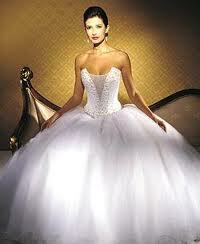 Many brides choose to have a strapless ball gown wedding dress due to the luxurious features included with the dress. Wedding gowns have the ability to be created in almost any material. Many dresses will be made of one fabric, but be adorned in another for added texture. The lace wedding gown is easy to find and available at most bridal stores. Due to so many possible styles to choose from, it is easy to find a gown that will be unique for any wedding.